Enjoy a passenger limit of six on our yacht with three state rooms, three showers, three heads, a full kitchen, and lounging space to accommodate any relaxing position. MANA Cruises provides you with everything to enjoy the experience of the full Hawaii yacht charter you’ve always wanted at rates per passenger or per boat. Cruises include soft drinks, bar, menu, activity gear, extra towels and more. Book per passenger or book the entire boat! MANA Cruises offers day trips, sunset trips, and private charters that can include snorkeling, fishing, sailing, and more. Our 46′ world recognized luxury catamaran will put you at ease and relaxation. Join us for your unforgettable experience. Whether you’ll be enjoying a day on the water with your special someone or booking the entire boat for your family, MANA Cruises will be sure to highlight your Hawaii experience. Take a sail down south with our trusted partners. First and foremost, all our cruises are done bare foot aboard our vessel. There is no need for heels and boots as all footwear will be removed. Holo Holo Morning Cruise: Wear anything comfortable and flexible. If you plan to jump into the water with us, bring or wear your swim suit/shorts. A hat for sun protection is always a great idea to ensure you don’t burn your head and face. The Captain’s Sunset + Tasting: Button downs and dresses are welcome to the boat, however keep in mind the possibility of windy conditions – so, anything comfortable and flexible. Whether Summer or Winter, the temperature cools quickly when the sun disappears; bring an extra cover up or sweater if you get cold. What kind of ocean life will I be able to see? Throughout the year we encounter various species of Fish, Turtles, Eels, Crustaceans and marine mammals such as Hawaiian Spinner Dolphins and Humpback Whales (Seasonal). Our Holo Holo Morning Cruise will provide the best opportunity to see a variety of ocean life through snorkeling and time capabilities. Though we love to view our wonderful Hawaiian ocean life as much as possible, it is within our company’s discretion to respect the legal and safe viewing distances applicable to each species. Yes, we provide various types of gear to help you enjoy the water! For snorkeling we provide professional masks, snorkels, and fins for both youth and adults. We also provide high visibility snorkeling vests and belts for comfort and safety. For more in-water fun, we also provide inflatable inner tube floats. How many passengers can Mana Cruises accommodate? All cruises provided are limited to a passenger count of six (6). Mana Cruises promotes a comfortable and intimate setting where ample space is available to everyone. Whether you are a couple or a large family, rest assured that you’ll have room to stretch out and personal attention at any time. What kind of drinks are available? Enjoy hosted drinks from Mana Cruises! We offer bottled water, various sodas, local fruit juices, beer, white wine, spirits, and champagne. Our spirits consist of Rum, Vodka, Gin and Whiskey. Specialty drinks are available upon request and at an additional cost. If you require a certain water, soda, or liquor please contact us or include your request in your booking. We will do our best to accommodate you. Guests are also welcome to bring any other drinks aboard; Mana Cruises does not charge corkage fees. Yes, we have a cancellation policy for both our guests and our company. Any per passenger bookings for the Holo Holo Morning Cruise or Captain’s Sunset + Tasting must cancel reservations no later than 48 hours before the scheduled departure. No refunds will be given to these bookings canceled within 48 hours of the scheduled departure. Charter and Private Boat bookings must cancel reservations no later than 5 days before the scheduled departure. No refunds will be given to these bookings canceled within 5 days of the scheduled departure. A cruise or charter can be cancelled at the captain’s discretion any time before the scheduled departure. 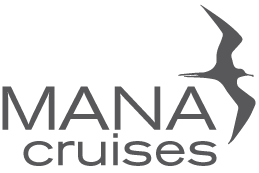 A full refund will be provided to all paying guests when a cruise or charter is cancelled by Mana Cruises LLC. Though we do our very best to avoid these situations, poor weather, safety concerns, and unforeseen mechanical problems can arise at anytime. * Taxes and Fees applied upon reservation. Per person bookings may be subject to a passenger minimum requirement.